Description : tablesorter is a jQuery plugin for turning a standard HTML table with THEAD and TBODY tags into a sortable table without page refreshes. tablesorter can successfully parse and sort many types of data including linked data in a cell. Datatable - looks futuristics isn't it ? Well Datatables ! everybody out there working on Dynamic Tables can't stop talking about it because of the amazing flexibilty and combination of features this gives. 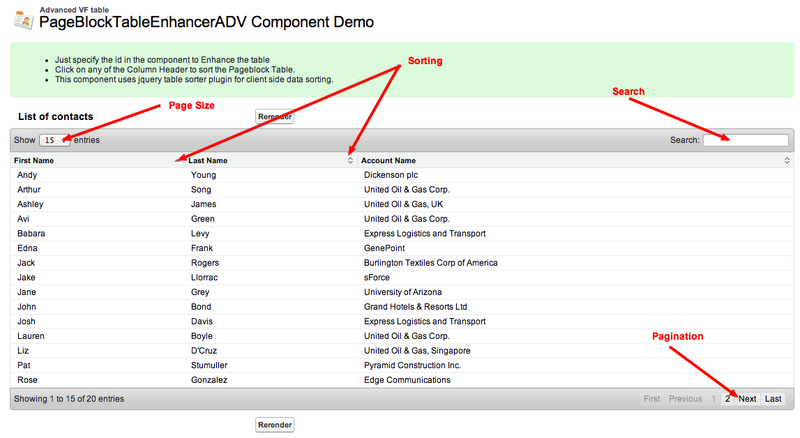 Features like Sorting,Pagination,Search can easily be implemented on very large table just using this table. And there is no boundaries support PDF/CSV export has been recently added and everyday some new plugin is introduced. Its the plugin of the future! Its still actively developed, there are lot of user already using this, new features are added and I see a lot of scope here! I have been trying to combine Datatables with Standard VF Pageblock table. But somehow wasn't able to make them work together. But finally I was able to combine them and result is just awesome looking new table!. Yes I was successfully able to combine them and create a new component called PageblocktableEnhancerADV(adv for Advanced, lol I know that sounds a bit funny ) . I kept both of the plugin alive because people can choose from which one they want. If you like the Default look and feel you can go with PageblockTableEnhancer else you can use the new PageblocktableEnhancerADV. Personally I feel like there is lot of scope in PageblocktableEnhancerADV, since its based on Datatables there is lot scope and there is a long list feature waiting to be ported. So Introducing the "PageblocktableEnhancerADV" with the backbone of "PageblocktableEnhancer", same ease of use, same set of parameters, just one line and you are ready to rock! No Coding and Changes Required in existing code. This version brings in support for rendering, the earlier version wasn't able to handle this. So incase you are rerendering your table or the parent components, you can call the "initPageBlockTableEnhancerADV()" method from "oncomplete" even of your commandButtons/actionFunctions/actionSupport/commandLink . First - So let's start by saying I SOOOO APPRECIATE you doing this!!! Easiest way to better format a table in Salesforce. THANK YOU!!!! Second - In the old version, the original sort of the data from the original APEX query remained intact. With ADV, the data gets resorted it seems by whatever is the first column. Any tricks how to keep the original sort? I am glad that you liked it. I wasn't sure that if people were using it. Anyways the dataTables has its own set of API, I guess I have to dig into it check if something can be done. Don't worry I am working on it, I will post and update once I am done. I tried using this table and the initial sort changes to the first column. Wow, I like this component much better...It does duplicate the header and footer panels on a re-render when I just re-render the pageblocktable. When I changed the code to re-render the pageblock that contains the table it worked great without the duplication. Again I'll be glad to send my code, just get me an email address. HOWEVER, when pairing this component up with your new VFUIBlock the block stop functioning. Is there an order I need to have the components declared in my VF page? Well ok try loading the PageblockEnhancerADV first and then VFUIBlock after the component. Make sure you set "importJQuery" to false for VFUIblock. Well you can use my contact page to submit the code or mail me at my gmail account "avidev9"
Peter, this component is targeted to make the experience with PageblockTable better and but it doesnt actually alter the governor limits associated with a PBT. Well talking about a custom component I can make a new component to show nearly 40K records on a page, but this has to be a custom standalone component and will depend lot more on your requirement and data that you are displaying. Avi that sounds like something that we should potentially talk about. I have 2 objects right now that we had our original developer build controllers on for related lists. right now with the field set currently in use the viewstate maxes out at 600 records. would you like me to submit a project form above? Will do, might be a day or 2 need to finish a few other projects, btw, currently this does not sort by date correctly, it counts it as a string. any idea about how that could be solved? Hi Avi, I am finally getting around to this upgrade but now I am using it for a dozen VF pages, any advice to a non SF wonk on how to upgrade without deleting everything? Can you provide me your valuable thoughts. How can i disable sorting for particular column of pageBlockTable? Currently it is not possible to do this in current version. Will be adding this support in subsequent releases. Is there a parameter to tell what column to sort by? Currently it is not possible to do this in current version. I will adding this feature in next releases. By the way thanks for the review! Is this still planned? I'm lazy and hate mucking around with the comparable interface in the controller in order to get my data to have a default sort. Sorting on Currency fields not working ? Hi. Look like your plugin doesn't support more than 1000 records. Do you have solution for this in last release? I am using this new table in a visual force page which shows opportunity records based on a criteria. I have an Action column with an Edit button. On the click of Edit button, a popup opens up with some fields for users to enter data and save the popup. My question is, the data is getting saved into the table but, I am unable to save the column sort order which was selected before the Edit the button was clicked. Please respond asap. It is not sorting correctly for me as far as dates it sorts by number and when trying to sort my amount field it only sorts by number and not by the thousands place so I have 1,000; 12,000; 2,000; 23,000; 3,000. Please advice. Facing issue in IE 11, can anyone help me out on this? Functionality is great, it will be wonderful if it also shows PageNumber. - add integrated option like a "Select All/Deselect All"